As I have mentioned in my previous articles on Plettenberg bay , Robberg Peninsula is an outcrop of land that forms the western boundary of the bay at Plettenberg Bay. This outcrop is about eight kilometres from Plettenberg Bay via road and about five kilometres if you walk along the beach. 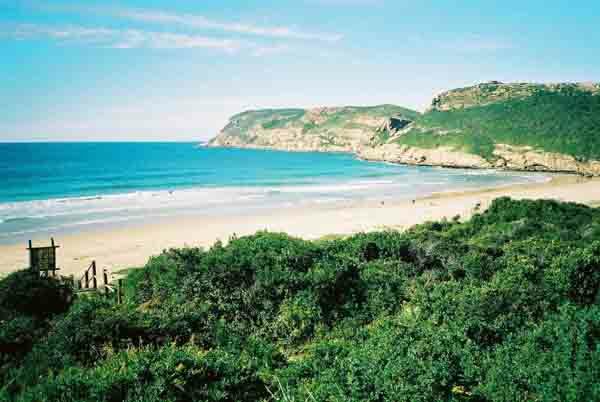 The Robberg Peninsula has been proclaimed a Nature Reserve and Marine protected area. At the entrance is a gate where permits can be purchased to enter the reserve. From the parking area to the southern most point of the reserve is about three kilometres. A hike to the point and back takes about four hours. Robberg dates back to the middle and later stone age. It was first occupied about a 120000 years ago when the sea level dropped. On the peninsula there are several caves where evidence of Stone age occupation has been found. The first modern history was recorded in 1630 when Portuguese sailors were shipwrecked on the beach and lived there for nine months while they built two small boats which they used to get back to Portugal. They were shipwrecked a gain before they reached Portugal. The rock formations on the peninsula date back a 130 million years to when Gondwanaland broke up to form the continents of South America, Antartica, Africa, India and Australia. There is no human presence on the peninsula save for visitors and nature conservation officials who work there during the day. Robberg is home to the rare blue duiker, a small antelope. It lives in the thickets on the peninsula and it feeds on leaves and vegetation it can find in the area. An adult male measures about 30 centimetres at the shoulder. The Cape fur seal comes ashore on the peninsula at a place called Kanonkoeelgat. (translated it means cannon shellhole). Some of the adult males weigh in excess of 350 kilograms and grow to about 2.1 metres in length. The “Point” is the place to to see some of the many resident seabirds. The terns, gannets, and cormorants roost on the peninsula and feed off the rich pickings found on the Agulhas Bank. At the highest point which is about a 146 metres above the sea is the Cape Seal Lighthouse. It is the highest navigational light found on the SA coastline. The light has a range of 27 kilometres and was built in 1950. To reach all the places I have highlighted above one has to walk along pathways which have been built along some steep cliff faces. In some areas there are sheer drops into the sea. One or two places along the walk are dangerous at high tide as the sea reaches the pathways when the tide is up. There are some interesting sea animals found in the waters surrounding the Peninsula. The Roman which is a bank fish starts life as a female and changes its gender to male when it gets large enough to start its own harem. Unfortunately this type of fish is vulnerable in heavily fished areas. If the male gets caught the females lose out on a breeding opportunity as they have to wait for one of their number to change its gender. This can have dire effects on the numbers. Kelp gulls also live and breed on the peninsula but as they were being disturbed by humans their breeding success started to fall away. To solve this problem wooden walkways were built to keep people out of their breeding areas and breeding has picked up again. Robberg is a very interesting place to visit for those who love hiking and nature. It is also relatively lonely so one can get away by yourself to revitalise your flagging spirits.